1. 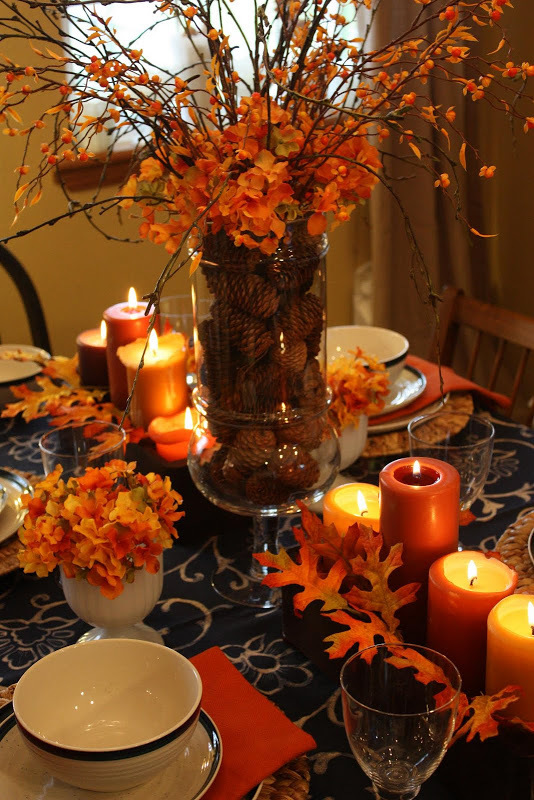 Fall Centerpieces always look amazing when you repurpose things you already have around the house that have a fall theme. And it’s super frugal! This idea from WhatsurHomeStory.com takes candle sticks, a wooden tray, mugs, and great things like pinecones from the yard and some small pumpkins and ghords and voila! You have a beautiful fall arrangement that is simple, yet gorgeous! 2. This Fabulously Frugal Fall Centerpiece from OhSoLovelyBlog.com is so cute! I love how the simple process of wrapping some jars you may already have around your house with some burlap just screams fall! Even if you use cups or mason jars you may have, it is still a great concept to utilize! Simple, yet oh so fun! 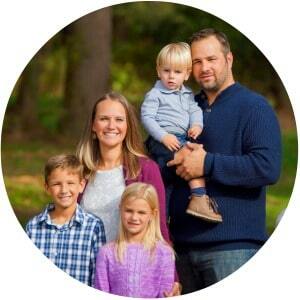 And this website will walk you through the process, step-by-step. You’re golden! 3. This Festive Fall Tablescape is not only gorgeous, but super easy! You won’t want to miss the great DIY instructions over at HGTV.com for this idea. It’s so simple that you won’t even believe it. 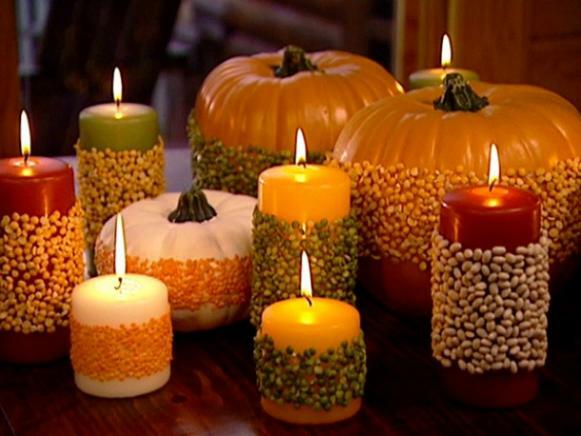 And I love the idea of using beans and lentils to dress up candles and pumpkins. 4. A DIY Wood Centerpiece Box is all the rage right now and I love that you can repurpose this idea for multiple centerpieces throughout the year. Found over at TheFrugalHomemaker.com, it walks you through how you can get your wood box ready. This is a great idea for filling it for a beautiful fall centerpiece, but you can use lots of different things you may already have around the home for fall. Get creative and head outside to find some pinecones, sticks, and acorns, and make a centerpiece that utilizes the things at your disposal! 5. How gorgeous is this Easy Pumpkin Centerpiece from SomethingIsDone.com?! This is such a simple way to spread the fall fun around your home. 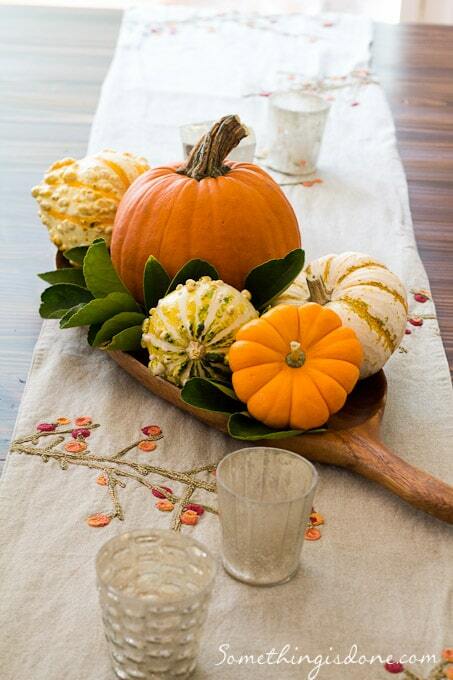 By simply arranging some small pumpkins and ghords on a wooden plate or tray you may already have and adding some green around the bottom with leaves you can pick up outside, you’ll be creating a great DIY fall look for your table. Don’t have a wood plate or tray? Get creative with something else you may be able to display your centerpiece on! 6. 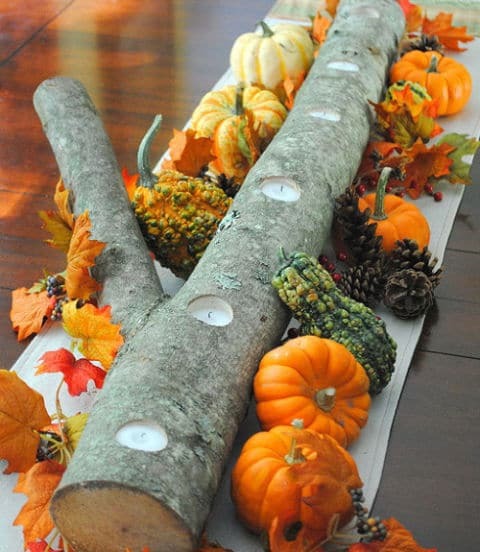 I just love this Thankful Fall Table idea over at 52Mantels.com! 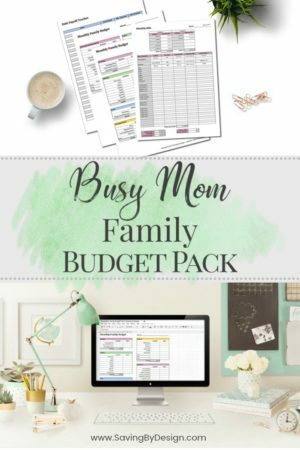 This may look like something that could potentially intimidate you, but I swear, it’s simple and easy! 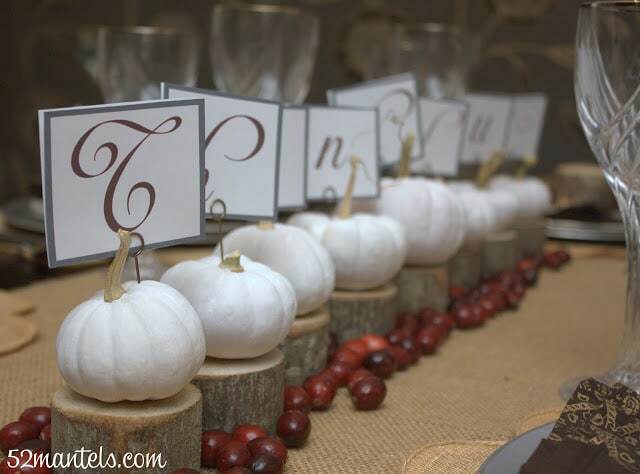 Paint some small pumpkins white, print out the free printable THANKFUL tags that are found on the website, arrange them on wooden stumps you can cut yourself and bam! You have yourself an absolutely gorgeous and unique centerpiece! Throw some berries, leaves, or vines around the wooden stumps and you are going to dress it up perfectly! 7. This Fall Centerpiece with Fruit and Berries is a bit of a different take on a fall centerpiece, but is a wonderful addition to any table! 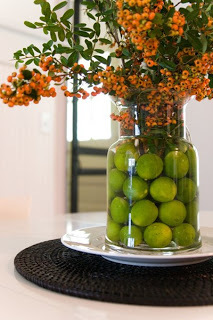 TheLetteredCottage.net shows how to set this up for your own home by simply grabbing some limes from the grocery store, filling up a large jar you have sitting around the house, and than adding some flowers and berries to it to bring out the fall feel. This would work great with lemons, too! 8. This has diva written all over it and I love it! This Metallic Pumpkin Table Runner idea from BHG.com is fit for a castle! Your castle! Get some gold metallic paint and get busy creating a centerpiece that will sparkle and shine all fall! 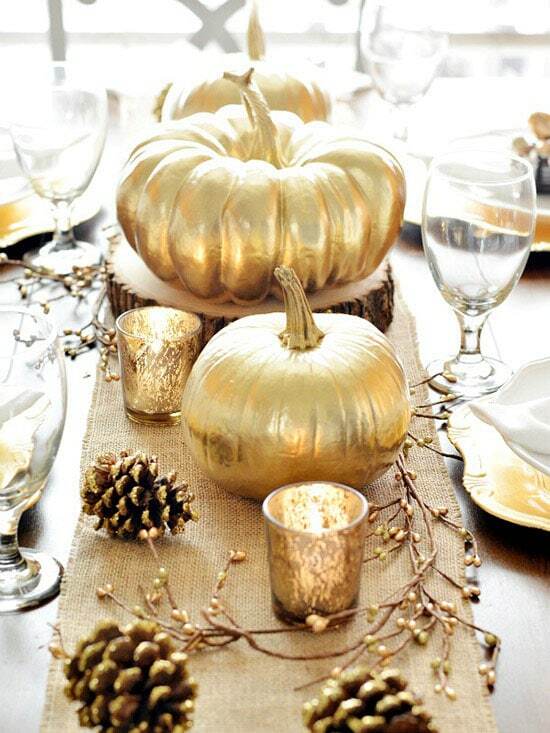 Glitter up some pinecones and add some great candles around the pumpkins and you’ll have everyone oohing and aahing! 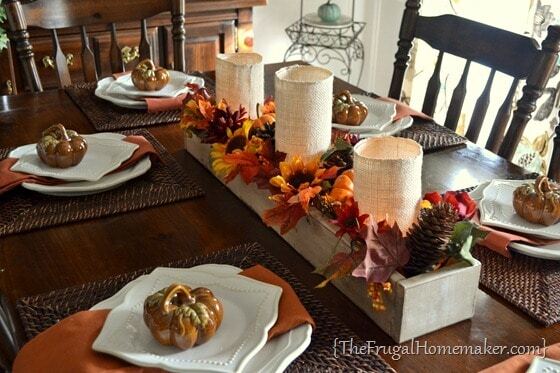 And I love how a simple burlap table runner pulls it all together for a cozy fall feel. Perfect! 9. A Pinecone and Twigs Centerpiece is always high on my list to bring a little bit of the outdoors inside for the fall season! Found over at SweetSomethingDesign.com, this great idea uses a pinecone filled glass vase topped with fall-colored flowers as the main attraction. Add some various leaves, candles and twigs spilling around the sides of your vase and it’s going to be hard not to want to sit at your dining room table all day admiring your great DIY skills! 10. 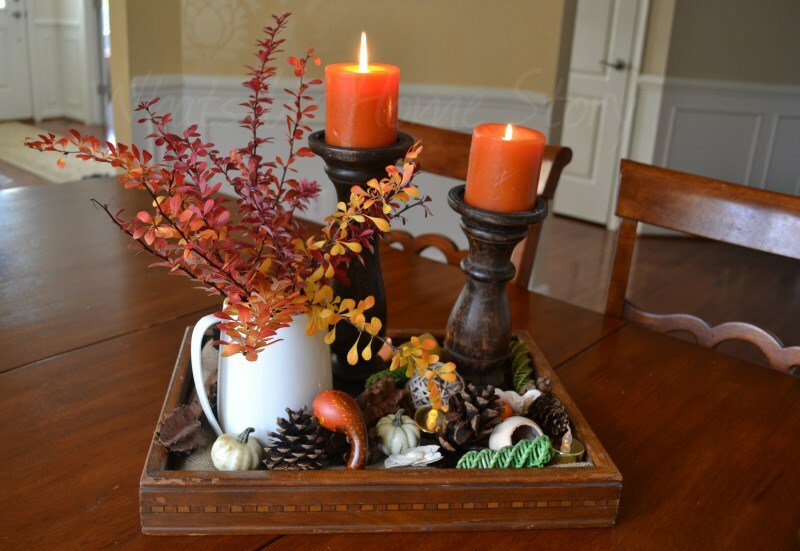 Finally, this DIY Log Autumn Centerpiece from JennaBurger.com really takes the cake for me and really goes to show how one man’s trash is another man’s treasure! She found this log that happened to fall outside and decided it would make a great centerpiece for her table and does it ever! By simply drilling some holes into the log and throwing some votive candles in, you’re really making a unique statement at your next fall meal! Dress it up with a burlap table runner, some small pumpkins and ghords and maybe even some leaf garland you can grab at your local dollar store, and it’s going to be an absolute hit! If you’ve never considered making your own incredible DIY Fall Centerpiece, make your plan to create one this year! You’ll be able to save so much money by going the DIY route, but it won’t take away from the great quality you can provide to your home. If you really want to make some frugal centerpieces, don’t be afraid to find the great sales as the fall items get put away in the stores that you can utilize next year. I always take advantage of seasonal clearance sales to build up my stash for the following year. You’ll be so proud of yourself and before you know it, you’ll be ready to create centerpieces for every holiday of the year. Have fun! 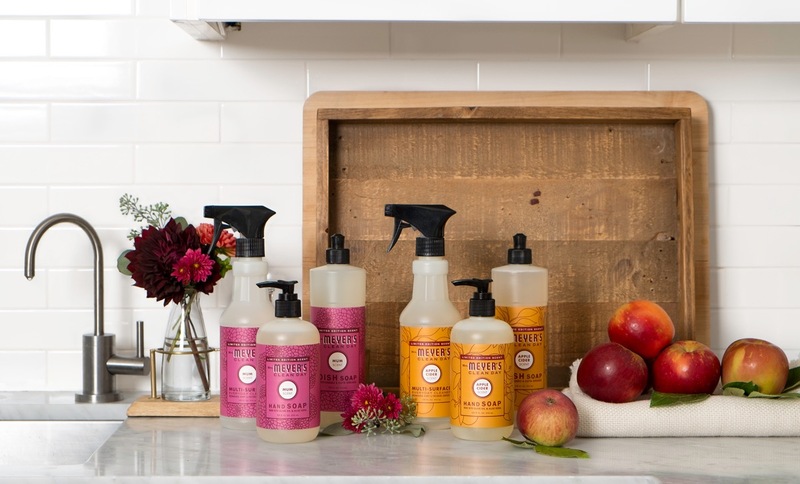 Speaking of fall, don’t miss your chance to grab these fabulous Mrs. Meyer’s seasonal natural cleaners for FREE! You can choose from scents in Apple Cider or Mum. They work hard to clean naturally while giving your home a boost of fall freshness. This offer is only available through October 23, 2016.